Poetry & Popular Culture correspondent Michael Butterworth sings with broken heart about the joy, verve and poetry that is, was, and might have been, the 2008 season for the Chicago Cubs. I know very little about poetry, but I do know a great deal about baseball. When the two meet, as they often do, I am ready with two standard references. The first comes from the former literature professor, Yale University president, and baseball commissioner, A. Bartlett Giamatti. Of the seasonal metaphor commonly ascribed to the national pastime, Giamatti—himself a specialist in Renaissance poetry—wrote that baseball “breaks your heart. It is designed to break your heart. The game begins in the spring, when everything else begins again, and it blossoms in the summer, filling the afternoons and evenings, and then as soon as the chill rains come, it stops and leaves you to the face the fall alone.” There is indeed poetry in Giamatti’s words. And truth. For as a devoted, and thus tortured, fan of the Chicago Cubs, this year's post-season has left me feeling quite alone. The Cubs began 2008 with the hope that springs from every team’s pre-season training camp. And with a roster that showed early and often that it was the best in the National League, that initial hope eased into confidence in the full bloom of summer. But the coldest autumn winds are those for which you—despite the lines of so many poets—are least prepared. And all the assurances earned during a summer of dominance expired in three short gusts of a Shelleyian west wind from Los Angeles. Almost before they began, the playoffs were over for the Cubs and their long-suffering fans. We have been here before, we Cubs fans. We know the cruelty of billy-goat curses, black cats, and Bartman. But this year was different. This year we expected to win. Yet the best team does not always win in baseball. Just two years ago, the 83-win St. Louis Cardinals won a World Series championship; five years earlier, the record-setting Seattle Mariners were bounced from the American League playoffs in spite of their 116 regular season wins. Losing, then, is always possible. And it is even tolerable—so long as your team plays with poetry. The trick, of course, is to capture this poetic essence in October. To their credit, the Los Angeles Dodgers did this masterfully. The Chicago Cubs, meanwhile, appeared to have lost their collective will and spirit. Consumed, it appears, by the weight of an epic 100-year drought, Cubs players looked withdrawn, apprehensive, and afraid to seize the day. As a consequence, their season came to an abrupt halt as the team across the diamond demonstrated the joy and verve that would have made Annie Savoy proud. Poetry is no substitute for talent, mind you. The Dodgers also won because they possess stellar pitching and a reinvented lineup that now features one of the game’s all-time great right-handed hitters. But even the most casual of fans would acknowledge that the Cubs gave themselves little hope. At the end of the day, what does our success matter if we cannot run and laugh and scream a little along the way? What good are 97 wins if we cannot express, exalt, and emote? These things I know about baseball; this is what we talk about when we talk about baseball. And I suspect they give me a little knowledge of poetry, after all. Michael Butterworth writes from Bowling Green University in Ohio, where he is an Assistant Professor in the School of Communication Studies and keeper of The Agon, a blog that takes on the "Rhetorical Contests of Sports, Politics, and Culture" at http://theagon.blogspot.com/. Who uses SNOW and SILVER soap. That SNOW and SILVER are the best. Which gives unbounded joy and pleasure. A gift most rare you will possess. Forgive "Poetry & Popular Culture" for being a little bit cynical in noting that Snow & Silver soaps fail to mention Harrison by name in their advertising poem, relegating his likeness to the reverse side of the card. I wouldn't be surprised to find a similar card published by Snow & Silver that has Grover Cleveland—Harrison's Democrat opponent and then-incumbent president—pictured on it as well. Indeed, like Big Oil or any industry seeking a lobbying presence in D.C. today, Snow & Silver soaps is playing two sides at once (literally), possibly even using the same vague poetic endorsement to promote both candidates. After all, as their poem indicates, the soaps' desire is more to ensure their own commercial success than to endorse any particular candidate or platform. Indeed, Snow & Silver is positioning itself not just as an equal opportunity endorsement, but as a purer expression of American democracy than the election! Buoyed by "the people's voice" and available to one and all, the soaps offer—at the minor inconvenience of sending in a couple of wrappers—"a gift most rare" to any American seizing the chance. Characteristically vague in this respect as well, the ad withholds what, exactly, that gift will be: a $10 gas card? A new hybrid? An oil slick in Alaska? If all this sounds eerily familiar, consider that we were talking a lot about the Cleveland/Harrison election a few years ago when Al Gore won the popular vote and our beloved W won the electoral vote. Indeed, it was the 1888 election that saw the Democrat Cleveland win the popular vote while sudsy-slick Republican Harrison took the electoral vote. Karl Rove or no Karl Rove, it's clear that, a century later, political endorsements, campaign ads, and the U.S. electoral system have yet—soap or no soap—to clean up their acts. 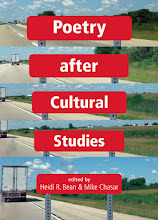 Postscript: In the time since the foregoing entry was posted, I had occasion to contact University of Illinois professor of English Cary Nelson, who has assembled a very large archive of 19th- and 20th-century advertising poetry. 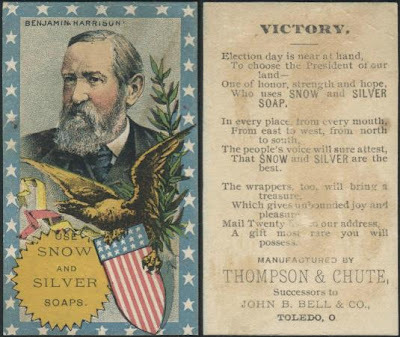 Nelson has confirmed my suspicions that, yes indeedy—you guessed it—Snow & Silver did in fact issue a trade card with the likeness of Cleveland on one side and the same "Victory" poem (pictured above) on the other. Pick a card, any card: it's business as usual.